Reviewing a book can sometimes be a tricky task. But sometimes, as in this case, it turns out to be kind of fun! 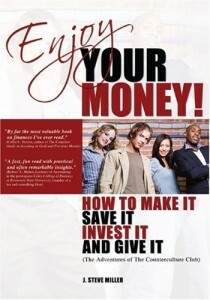 A few months ago, the Almost Frugal writers were contacted about a personal finance book written for young people. I felt everyone sort of collectively (and yes electronically) look over to me. As a 29 year old and the youngest writer here at AF, I was the logical candidate to read the book. Also about half the time I agree to review a book (not just on Almost Frugal but at my own blog), I never receive it. So I said sure, thinking it might not actually show up. A week later, the book arrived. “Enjoy Your Money! 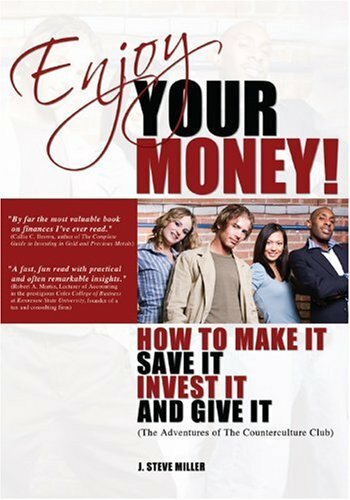 How To Make It, Save It, Invest It, and Give It” by J. Steve Miller didn’t look super long, but then I opened it. Holy text, Batman! But rather than judge a book based on formatting (or a cover), I started reading. The basis of a book is a group of four students and a mentor type named Mrs. Kramer. They get together every week for breakfast and to talk about money as part of the “Counterculture Club”. Occasionally there are guests who show up to breakfast and the whole thing is like a flashback, as the ‘kids’ are now adults having a reunion. Overall the book is in dialog format, like a play, with occasional assignments and recommended reading. For awhile, it drove me a little nuts but last night I realized I had gotten half way through the book without even realizing it. I guess a change of format is sometimes nice to have! One thing you learn as you get older, or even just as you take more classes, is that you can get explained the same thing in multiple ways and, at one point, an explanation hits you and you just ‘get it’. This book explains things like compound interest, living below your means, etc. with multiple examples so many different times that I think there are a lot of different opportunities for people to ‘get it’. And the book focuses on normal people who are rich but don’t ‘act’ rich, a lot more of an attainable goal than winning the lottery or becoming famous only to make more money than you can possibly spend. This book was unexpectedly good, so much so, I am going to lend it to a few people I know. J. Steve Miller does a great job and knows his stuff. As everyone who reads says, I should have read this years ago! Good news: it’s never too late to start. Click here to read what some other people thought on Amazon. Nicole – I’d love to see your pics of the dogs with short legs. I just got a new dog – who’s missing one leg (she’s an American Bulldog that was a stray, hit by a car, that was brought to my vet’s office). Since my son works there – he fell in love with Lucille and now she’s in our home. Thanks for the review – I agree that my husband, J. Steve Miller, is a terrifically smart guy about finances. And, his book is just the thing for learning the ropes of a financial life of excess – which includes “giving” to stray dogs.